This is a truly incredible poster. 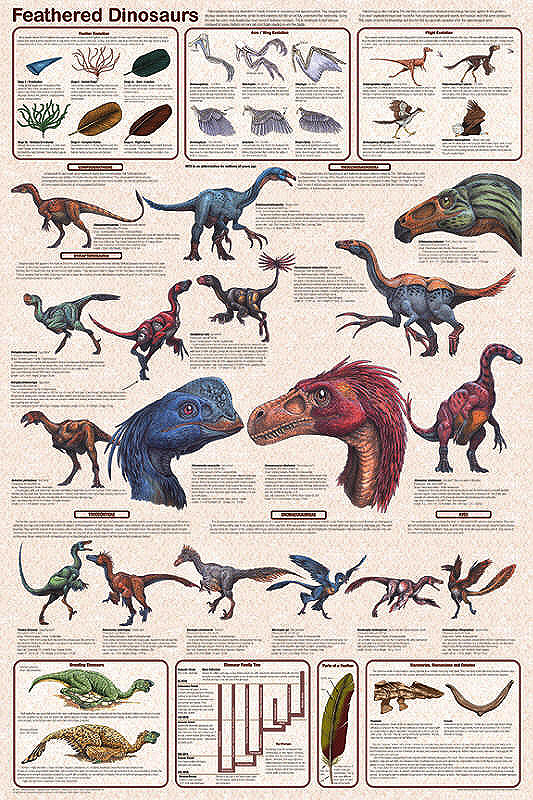 It shows 18 magnificently detailed illustrations of the various species of feathered dinosaurs. The three insets across the top explore Feather Evolution, Wing Evolution and Flight Evolution. Across the bottom, additional insets explores "Brooding Dinosaurs?" Dinosaur Family Tree, Parts of a Feather and a special section that discusses Discoveries, Discussions and Debates. This is truly a comprehensive overview of an exciting cutting edge subject. Some of the illustrations are shown below. All posters are 24" x 36"